Thanksgiving has came and went. Whew! This was my first year hosting the Thanksgiving Day holiday at my home. I gotta say that I was probably nervous about the whole situation for the month leading up to it. I know that a lot of work and prep goes into pulling off this festive day. Our feast that we had here was perfect and excellent from start to finish. I was satisfied with how every single element of it came out. No complaints whatsoever here! I hope all of my readers also had a great holiday and enjoyed their big plate of food! Here is a look at my dinner plate from Thanksgiving! I have a little bit of everything on my plate: roasted turkey, redskin mashed potatoes with French butter, Brussels sprouts, wild rice stuffing with mushrooms and cranberries, White Castle stuffing, Clean Bean (green bean) Casserole, ambrosia, sweet potato casserole, and my favorite~ Everything But The Kitchen Sink Cranberry Sauce! I am hoping to do a recipe post soon for my famous cranberry sauce. I can turn any cranberry-sauce-hater into a lover! So far it has worked with two haters in my family. Today I will be discussing Thanksgiving and how we pulled it off. I could not have possibly made this day possible without the help and support of my family. My mom, Kathie, was a huge help. She purchased the turkey and a great majority of the food that was served. Money is super tight right now with my family so I was very grateful that she pitched in (big time) to help me create this feast. My mom bought the 19-pound turkey and an electric roaster to cook the turkey in. I spotted the roaster when we took a trip over the Costco and I thought it would be a great idea to cook the turkey in there so we could free up the oven space for the side dishes that needed to be warmed up. Turned out to be the best idea ever! My stepmom, Evelyn, was also a huge help. She came over early on Thanksgiving to help my mom and I prep. Evelyn brought over an appetizer and a side dish to pass as well. The appetizer that she brought was unique. They were bacon-wrapped water chestnuts. Sounds strange, doesn’t it? Well, they were delicious. These got gobbled up pretty quick. For a side dish, she brought her famous sweet potato casserole. My stepmom was incredibly helpful with the kitchen clean up as well. That helped me tremendously. The day before Thanksgiving, I did what I could to prep for the big day. The first thing that I did was I created my Pumpkin Spice Cheesecake. This is my favorite fall dessert at the moment. I wanted to get that done early because the cheesecake needs to set for at least six hours. I gave it plenty of time to set by creating it the morning before the holiday. I have a recipe for this paleo/vegan cheesecake on my blog. I did modify the recipe just a tad bit. Obviously, I did something different for the topping. Instead of creating a whipped cream with coconut cream I topped this cheesecake with a ton of walnuts and pecans. I wanted to make it extra nutty. I purchased a can of non-dairy, almond milk whipped cream to top it with. Instead of using the spices individually I used a jar of pumpkin pie spice. I also busted out my slow-cooker the day before Thanksgiving to make my paleo cranberry sauce in advance. This is one of those set-it-and-forget-it recipes. I love cranberry sauce and my cranberries have the power to turn cranberry sauce haters into lovers! My husband never eats cranberry sauce. Guess what? This year he did! And I know that he enjoyed it because he helped himself to some for his leftover plate. This cranberry sauce is simple to make. I call it my Everything But The Kitchen Sink Cranberry Sauce! There are many ingredients that go into it but it is very easy to create. There are no refined sugars in this cranberry sauce. I use an entire bottle of pure maple syrup to sweeten it. I also use fresh-squeezed orange juice, orange zest, two ambrosia apples, walnuts, and pecans to create the sauce. The apples are a nice, welcome addition and the nuts give it a great texture. The sauce is heavily seasoned with pumpkin pie spice. I picked up a bottle of the Spice Hunter’s Pumpkin Pie Spice at Nino Salvaggio’s in St Clair Shores. This pumpkin pie spice seemed like a wonderful blend of spices. It worked out well in my Pumpkin Spice Cheesecake too, so the funds I spent on it was a great investment. You can pick up a bottle of this awesome pumpkin spice seasoning on Amazon. I highly recommend using this Spice Hunter blend for all of your fall flavored foods. 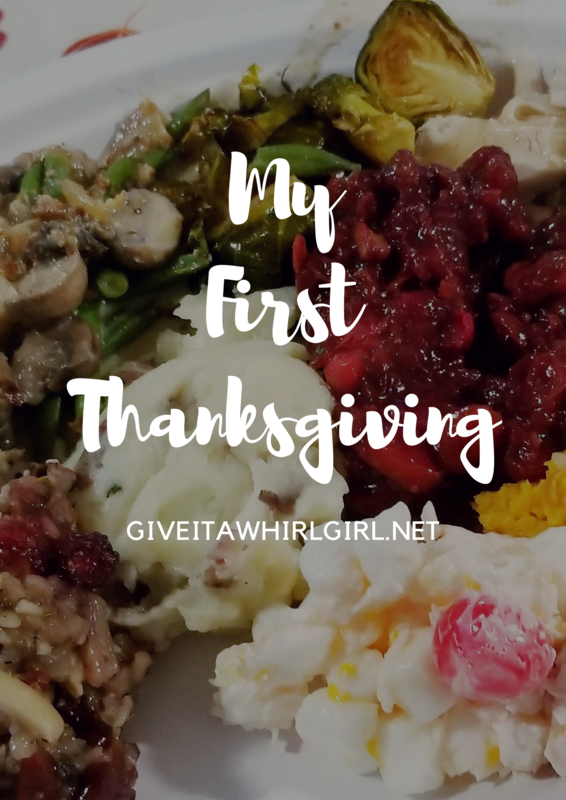 I wanted to have a gluten-free option for stuffing so I searched the web for a great slow-cooker recipe, and came across a recipe by Well Plated for wild rice, mushroom, and dried cranberry stuffing. This turned out to be such a great gluten-free option and I would totally love to whip this up again. The mushroom sauce turned out nice and creamy (way better than canned). For mushrooms, we went with the baby portobello mushrooms. They turned out to be a better alternative to plain ol’ regular white mushrooms. I wanted to use cremini but I was not able to locate any so maybe next time! Here is a video provided on how I used this recipe from Well Plated.Â Be sure to check out her blog for more great recipes! I wanted to have a green bean casserole to go along with my Thanksgiving feast. I don’t know about you, but I sure hate the thought of using canned green beans and a can of cream of mushroom soup for my recipe. So for this green bean casserole, I made my own creamy mushroom sauce and I used two big bags of fresh green beans. For the topping, I roasted some slivered onions and shallots in the oven and coated them with my Bob’s Red Mill Almond Flour. This recipe was inspired by Paleo Grubs. I used the recipe to guide me along the way I put my own spin on things. It is a fantastic green bean casserole recipe so please be sure to check it out on the Paleo Grubs blog. White Castle stuffing was my mom’s grand idea. Our family has always been a fan of the White Castle sliders so we figured we would try out the stuffing that we would hear about year after year. I usually avoid gluten but heck, it was Thanksgiving and I had to give this stuffing a whirl. It sounds crazy to use hamburger sliders as the main component in a stuffing recipe, but I am telling you that this was actually incredible! I really wish I would have taken more photos of the appetizers that we had. I was so busy it just slipped my mind I guess. I made a delicious maple pecan baked brie. Oh my gosh, it was soooo good. Definitely my favorite appetizer of the day. If you want a great recipe for this brie I used the recipe from Mother Thyme and it was pure excellence! Check out her blog for other fabulous recipes. We had some cheese spreads, Boar’s Head salami sticks, meatballs from my sister, and those bacon-wrapped water chestnuts from my stepmom. Missing in action here with the photos I took are the mashed red skin potatoes. Me and my mom recently discovered Kroger brand (Private Selection) French butter. It is a very rich and creamy butter and it will be my new go-to butter for my mashed potatoes. This side was not planned for the Thanksgiving Day feast over here. I had a giant stalk of Brussels sprouts in my fridge and I figured that I could incoporate them into the meal somehow. I roasted them for a bit and then finished them off in the oven with some pure Michigan maple syrup. I have a big adoration for anything roasted with maple syrup, especially this time of year in the fall. Everyone that took some for their plate loved them so I am very glad I used them up for Thanksgiving. My stepmom brought over a sweet potato casserole and I was grateful for that. I like sweet potatoes but I’m not normally a fan of sweet potato casserole. I put a bit of everything on my plate this year and I did give her casserole a whirl. I ended up loving it and I am glad that I had a big dab of it on my plate. I have no idea why but my family has always called ambrosia Bunny Salad. My mom brought this dish because ambrosia has always been essential in our family for Thanksgiving and Xmas. My daughter always looks forward to this dish because it has marshmallows, pineapple, and maraschino cherries in it. The star of the show! The turkey! Here is a video below of us prepping the turkey. The turkey sure was a big task at hand. My mom and my stepmom all put our heads together to tackle this beast! It was quite an experience for the three of us. We had the electric roaster to use and we had to figure out the best way to prep the turkey. I made an herbed ghee mixture with some 4th & Heart ghee, sage, and thyme. I used the entire jar or ghee to make the mixture for our 19-pound bird. I used dried herbs in the mixture. I rubbed it under the skin and I also painted the mixture on top of the turkey. Then we stuffed it with four lemon halves and some fresh rosemary. We inserted an electric thermometer into the deep part of the thigh and closed the lid on the roaster and prayed for the best! This was a first-time ordeal for the 3 of us so I was nervous as hell about how this turkey would turn out. It took about five hours of roasting for the turkey to be completely cooked throughout. My husband, Joe, was the one with the electric knife. He did a wonderful job with the slicing of his first turkey. Our awesome spread of Thanksiving food! I truly apologize for the poor lighting on these photos of our spread. This turned out to be the best Thanksgiving Day spread of food that my family has ever had, at least in my opinion anyway… wink! We did run into a bit of a problem though. Everyone did get a great big helping of our roasted turkey from the 19-pound bird, but there sure was not much left for leftovers for everyone to take home. Insert sad face here! My mom and I were able to snag some turkey leftovers and a ton of sides but we just did not have enough to give my dad and Evelyn and my sister and her children. I felt pretty bad about it, but hey, this was a learning experience for all of us. Next year I am quite certain I will be hosting again so we will just get a much larger turkey. Lesson learned! My daughter, Chloe Pearl, brightened up my day with a drawing that she did in the morning about Thanksgiving. This drawing is a keeper and I will cherish it forever and ever! In the drawing, she illustrated the Thanksgiving foods that I created. She drew this to remind me about what a great cook I am. I truly appreciate her kind words and the fact that she is thankful for all of the hard work that I do in the kitchen for my family. Cooking is my number one passion in life and I always pour my heart and soul into the food as the main ingredient. I think we all deserve a pat on the back for coming together and cranking out the perfect Thanksgiving holiday for our family. It was a ton of work, the most I have ever in my life done for a meal! The hard work definitely paid off and it was completely and totally worth all of the effort (and money!) poured into it. I am already looking forward to doing it again next year. In the meantime, I will also be hosting Christmas this year for my family. I am not sure exactly what will be served. We are leaning towards a prime rib and a Honeybaked Ham. My mom will be helping me out with the Christmas dinner as well. I am so thankful for my mom for always being there for me when I need her. She is truly the best! Did you know that I talk to her on the phone every single day? True story! Love her so much and I hope she lives to be 112. Tell me about your Thanksgiving! What did you cook for the holiday? I would love to hear from you. This entry was posted in My Cooking Journey and tagged appetizer, cashews, cheesecake, cooking, cranberries, cranberry sauce, dessert, ghee, gluten free, glutenfree, green bean casserole, herbs, holiday, mushroom, nuts, paleo, pecans, pumpkin spice, slow cooker, Thanksgiving, turkey, vegan, walnuts, wild rice. Bookmark the permalink. Your Thanksgiving feast looks wonderful and so delicious!! Your cranberry sauce sounds really good. My mom has a pretty good recipe for it too so it’s definitely one of my favorites. I’m glad you had a great time hosting your first Thanksgiving dinner! Thanks so much! Hope you had a wonderful holiday as well! Your spread looks delicious, especially the turkey. I am going to give that White Castle Stuffing a try!